Hit the tropical beach bar and win up to 75,000 coins from just 25p a spin. 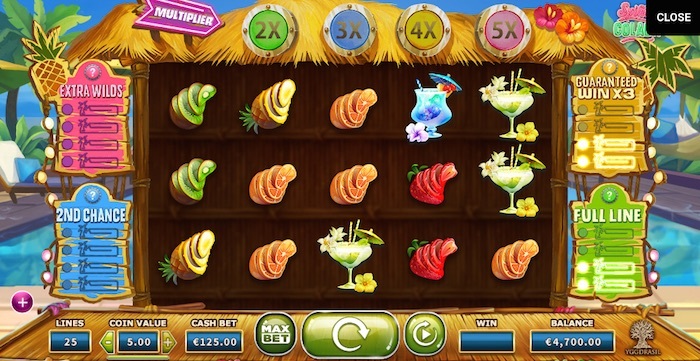 Spina Colada is a cash cocktail of re-spins, column multipliers and 4 collectable features. It’s got 5 reels, 25 pay lines and is based on cocktails. What’s not to like about Spina Colada from Yggdrasil. Playable on mobile, tablet and desktop from 25p to £125 a spin, the game features colorful graphics and holiday mood sound bites. The tropical theme is relaxing, there’s a good pay table on offer and its got a payout rate of 96.3% RTP. But what’s most attractive is the 25p slots 75,000 coin maximum win. Yggdrasil is the self-proclaimed creators of superior gaming. So the first thing we notice is the Spina Colada slot design. It’s a little unusual, but that’s how the slots features come into play. While the 5 reels contained in the tropical beach bar stand out, you’ll notice lots of additions around the outside. Spina Colada can freeze re-spins and allow columns to build up and pay out as multipliers. And it doesn’t end there. The refreshing online slot offers 4 collectable features, all with a different job. These collectables also happen randomly in the base game so that anything can happen. When I say anything, I mean 2nd chances and guaranteed wins with 3 x multipliers! It doesn’t stop there. Fill up the collectables, and there are 4 free spins. 25p online slots don’t get more spin quenching than this. How much can you win playing Spina Colada slot? With coin values of 1p to £5 and 25 coins played at any one time. Spina Colada offers variable betting for everyone. But how much can you win playing this tropical themed slots game? Firstly we’ve got lower and higher symbols, and then there are the bonus multipliers. So let’s look at playing for 25p and £125 a spin. The smallest and biggest bets. 25p slots players could win a smallest pay line prize of 3p for 3 x melons (fruit symbols are low value) while 5 x pina colada drinks at 200 coins would return £2.00. But that’s just on 1 line, and this game has 25 of them. In theory, you could win up to 75,000 coins playing this slot. At 25p that’s 25 x 1p coins = £750. While the Spina Colada jackpot is 200 coins, there’s a 5 x multiplier in the 5th column making 1000 coins possible. If you want to high roll, £125 bets will return the following amounts. At this level, your coins are worth £5. The paytable now offers a smallest possible win of £15 while a 200 x coin jackpot means £1000. These also just pay line wins, again you are reminded that Spina Colada has 25, the column multipliers could make a difference too. The biggest win of 75,000 coins would be equal to £375,000 if high rolling at £125 a spin. Freeze, re-spin and multiplier, feature cap collection board and free spins. Sounds complicated, looks it too. But how does it all work? The thing about Yggdrasil Gaming is that they’re pretty clever people, like most other developers I guess. In the Spina Colada online slot, Yggdrasil builds the main features around the frame of the reels. But first, what happens on the reels. The symbol freeze, re-spin, and multiplier is what you’re likely to see first. Hit 3 or more symbols on at least 1 pay line, and they’ll freeze remaining in place while the re-spin happens. What’s lucrative about this feature is the multiplier columns. Not only will you keep getting re-spins if more of the same symbols appear, but if they fill the columns up you hit multipliers on your win. The columns fill up from left to right with a super 5 x multiplier in the final column. Feature cap collection is random. That’s the four collectable tables located either side of the reels. Extra Wilds, 2nd Chance, Guaranteed Win x 3 and Full Line. So what are they? They are extras thrown in to increase wins. Collectables lead to the free spins bonus when you get all four in a cap, but they offer individual features along the way. When the Spina Colada game first opens up, each player gets two free capsules in the full line feature table. Each of the four could then be triggered at random, awarding “what it says on the tin” before adding itself to the collection. Once all four collectables are in your possession, the free spins will trigger. The free spins bonus triggers when you collect four of the same feature. You’ll collect 4 free spins. While this number might seem low, the free spins come with whatever feature triggered them. For example, you could win 4 x free spins with a guaranteed win x 3. That could be a hefty lump of coins coming back to you. Out of all 4 collectables, the guaranteed win x 3 is probably your best hope. Playable on mobile, tablet and desktop. Spina Colada is one of those 25p slots you can take anywhere. Thanks to its summer vibe and tropical bar laced with cash flavoured cocktails; there’s a winning menu that offers up to 75,000 coins you can’t help but taste. Big positives: four collectables that add weight to the game and re-spins with multipliers going right up to five. Get me another one!